“Huckleberry Finn” and “To Kill a Mockingbird” Dropped by School District Over N-word”—one version of headlines on February 8, 2018 in USA Today, the Minneapolis Star-Tribune, the Washington Post, and other newspapers. These headlines referred to the schools in Duluth, Minnesota, but similar decisions are occurring elsewhere. To say that the n-word is controversial today vastly understates the case. Harper Lee used the racial insult only a few times in To Kill a Mockingbird, whereas Mark Twain employed it 215 times in his Adventures of Huckleberry Finn. The mere presence of the n-word in books has increasingly become a justification for school districts to drop Twain’s novel from their curriculum inasmuch as it obviously makes students and teachers uncomfortable in the classroom. The following excerpts are taken from my essay in Critical Insights: Adventures of Huckleberry Finn, ed. R. Kent Rasmussen (Ipwich, MA: Salem Press, 2017), pp. 65-80. In 1991, I left my full professorship at a large southwestern university that had nearly 50,000 students and approximately a 3 percent African American enrollment. I accepted a departmental headship at a 5,000-student campus located in Montgomery, Alabama. More than one-third of the students at my new institution were African American. Many of them were descendants of the enslaved people once owned in that region, and some of the students probably had forebears who had picked cotton on the vast plantation where our college campus stands. My teaching assignments at my new campus principally consisted of American literature survey courses, which tended to draw the majority of African American students. Thus, my course enrollments were often half black and half white. Consequently, I began to look at Twain’s novels in a different light than I had viewed them in my teaching experiences in Berkeley, California, Austin, Texas, and Elmira, New York. . . . I found that Twain’s electrifying themes in Adventures of Huckleberry Finn—rebellion against authority, resistance to conformity, friendship across racial boundaries—were becoming obscured by my students’ palpable pain at being forced to read this word more than 200 times. I noticed that on the days when my reading syllabus assigned Twain’s novel, the absenteeism rate soared among my African American students. It occurred to me that I was equipped by my lifetime of studying and teaching Mark Twain to prepare an edition . . . that could offer teachers and school districts a workable alternative. . . . This optional edition could reflect our emerging sensitivity to racially disparaging words in authors’ texts. I approached Suzanne La Rosa and Randall Williams, cofounders of NewSouth Books, an intrepid press known for its titles on Southern culture, civil rights, and race relations, and proposed a duplicate set of editions [of Huckleberry Finn]. In one version, only the racial aspersions would be emended and the text otherwise left the same; the other edition would be entirely faithful to Twain’s original language. The volumes would have identical paginations, enabling students and instructors to have their choice. . . . The alternative NewSouth Edition would substitute the word “slave” for the . . . racial epithet in Huckleberry Finn. This is the alternative NewSouth Edition without the n-word, substituting “slave” for the racial epithet. Click here. For an excerpt from the introduction from the New South Edition. This the the Original Text Edition from NewSouth Books. 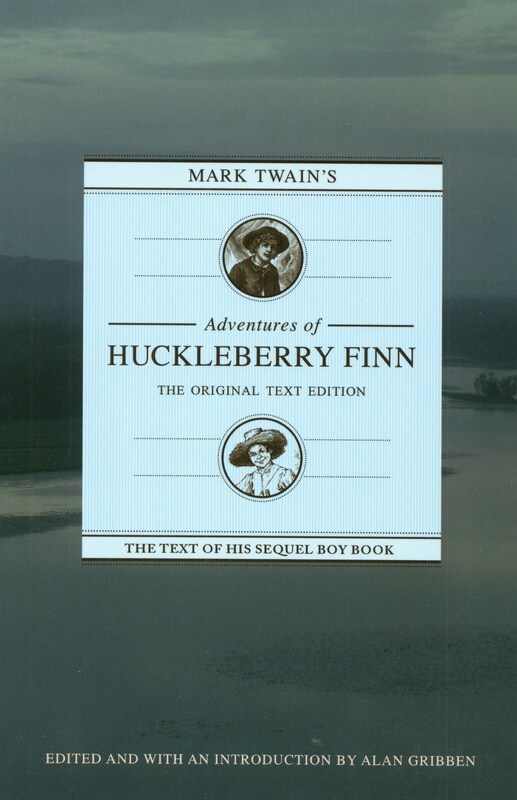 BONUS—76 Digital Illustrations for Huckleberry Finn. Please visit the video categories of this webpage for the digital illustrations and a brief video tour of Twain’s life through his books. Each book has an introduction by Dr. Gribben unique to that edition. Dr. Gribben has taught Huckleberry Finn with and without the n-word. In his college classes, he offers his students a choice about which book they will read. Both books have identical pagination. Most of his students choose the alternative edition. Dr. Gribben does not use the n-word in class.